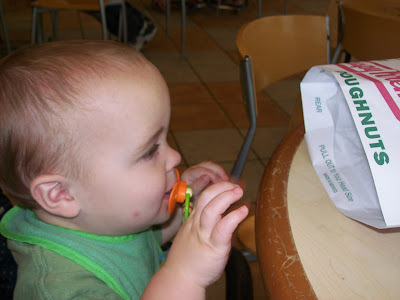 Last Saturday, Grayson attended a seminar downtown from 9 a.m. to 5 p.m., so the boys and I had a day to fill. 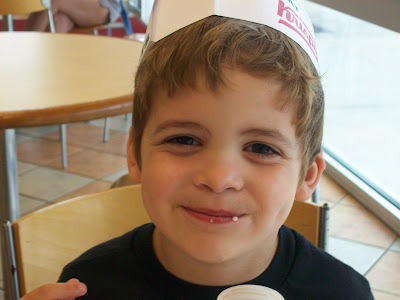 We started off with a soccer game at 8:00, and then we went to One of the Greatest Places Ever: Krispy Kreme. 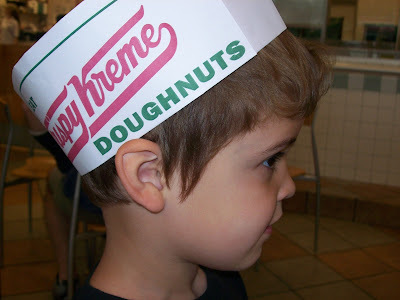 The boys love going there, not just because of the yummy doughnuts, but because they also have a huge plate-glass window that allows the patrons to see the doughnuts being made. You would THINK I took a picture of the doughnuts we bought and/or the conveyor belt with Fresh! Hot! Now! Doughnuts, but I did not. Somehow, I only ended up with pictures of the boys. 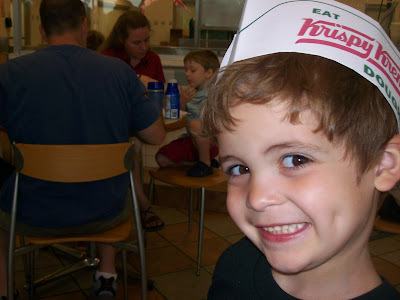 Krispy Kreme is always good for bringing out the dimples. But he loved playing with it on the table. In his mind, a hat on the table is worth two on the head. I'd love to say that I know why Nathaniel had this look on his face, but I'm at a loss. 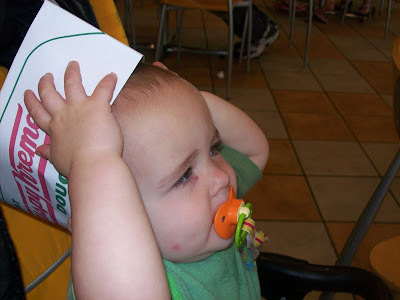 He may have just been trying to get me NOT to post a picture of him in his hat. But he LOVES the hat and the chocolate milk. 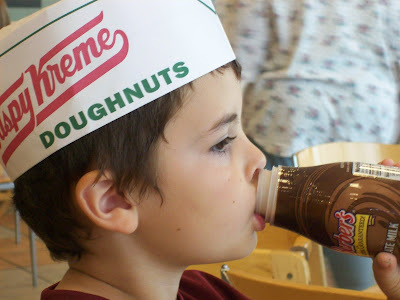 I always let them have chocolate milk with their doughnuts, because if you're eating Krispy Kreme, it's really not the time to start talking about drinking white milk because it's "healthier." That's like when I order a Diet Coke with my Oreo Cheesecake at the Cheesecake Factory. Pointless. And washing it all down with white milk. I can still get away with it when it comes to the 1-year-old. 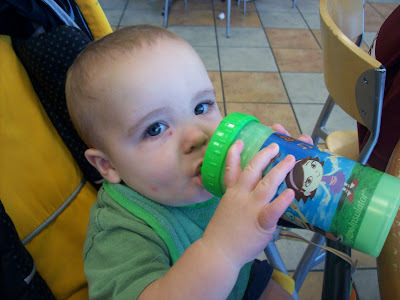 He won't start wearing me down about the chocolate milk for at least another year. Ryan Leigh, They're quite consistent at KK, wouldn't you say? 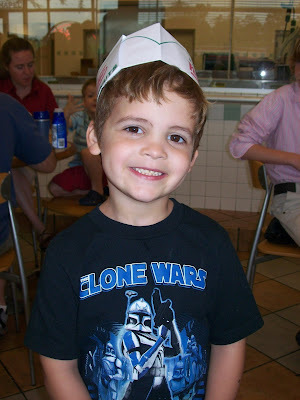 Same tile on the walls, same tables and chairs ... AND OF COURSE the same awesome doughnuts! Your husband has the exact same Favorite that I do ... the chocolate iced creme filled. I could eat my body weight in those! 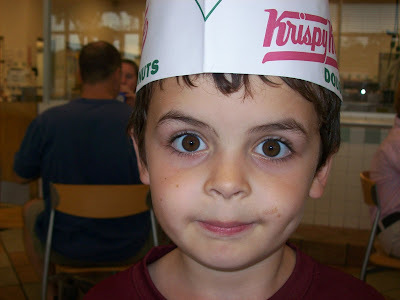 Oh my god, that picture of Nathaniel is HILARIOUS. He looks psychotic. Like a 6 year old serial killer. I am dying laughing.